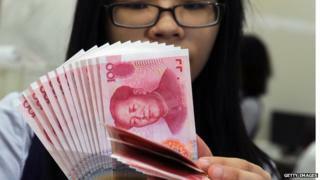 The Bank of England has agreed a deal with the People's Bank of China to make London a hub for Chinese currency dealing. The memorandum of understanding, to be signed on Monday, sets out settlement and clearing arrangements for the renminbi, or yuan, in London. The signing is expected to be followed by the appointment of a London clearing bank for yuan. 62% of yuan payments outside of China already take place in London. Following an agreement with Beijing last year London asset managers are the only ones in the West able to invest directly in Chinese stocks and shares in yuan. Last year the UK and Chinese central banks signed a three-year currency swap arrangement worth 200bn yuan which allows them to swap currencies and can be used by firms to settle trade in local currencies rather than in US dollars. The International Finance Corporation, the private sector arm of the World Bank, this month issued a 1bn yuan bond in London, the first by an international financial institution. The Chancellor of the Exchequer, George Osborne, said: "Connecting Britain to the fastest growing parts of the world is central to our economic plan. "It's why I've put such government effort over the last three years into making sure we're the leading western centre for trading in the Chinese currency. When Mr Osborne visited China in October, he signed deals to allow direct renminbi-sterling trading and to allow Chinese banks to set up UK branches rather than subsidiaries, effectively entailing lighter-touch regulation by the UK authorities.